My trainer came back from her two week vacation, and (big sigh of relief) no backsliding occurred! She pointed that out at my lesson yesterday, and I said, "Well great, I can let you take more vacations in the future." She was there for my warmup, and although Connor was feisty and frisky with much sassy head tossing, she pointed out that he was on my aids from the beginning, and also thinking very hard about what I was asking. We were just asking him for shoulder fore left, which he decided also meant haunches in, so we worked through that. The bulk of the lesson was spent on the idea that it's the outside thigh that turns him and ultimately will ask for the bend, not the inside leg. I'm not sure I put that quite correctly, but basically, my outside thigh is on him to meld the outside of his body around the inside leg (calf). There's a lot of play between the outside thigh and inside calf, and very little rein involvement. 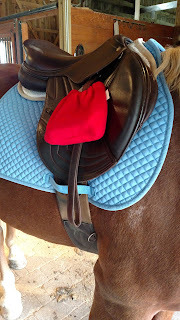 Look, a picture you haven't seen yet, the stirrup covers Mary bought me for my birthday (in CWD red, of course). Once again, in order for me to get this valuable concept, she actually walked next to me, put my leg in the right place and pressed my leg into the saddle, THEN I got it. It required my leg to move in a direction that, mobility-wise, I don't think I would have found on my own. She drove home the idea that I need to be turning the front of the saddle around the circle with my outside thigh without twisting my body in the saddle at all. 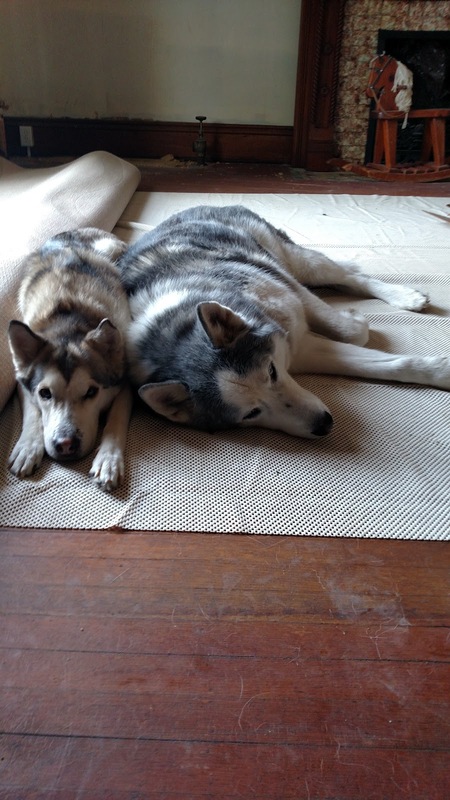 I got nothing picture-wise right now, have a picture of my two dogs in the "Roomba Fear Formation". The end result was, no kidding, the most bend we've ever gotten. Every single Dressage judge we've ever ridden a test for has said "more bend", and I've never really understood why until I felt what "enough bend" was on this horse today. 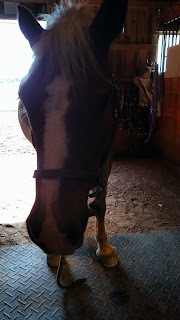 I'm excited to explore that concept further with our two lessons per week in October - it's a splurge financially, but I feel pretty strongly that I'm going to look back on this summer/fall as a pivotal moment in my riding education, and that it's going to be worth it. I've pretty much never regretted lesson/ training splurges. Where did Mary get your stirrup covers? Are they elastic at the top or do they tie? I'm intrigued. They are elastic and they actually fit over my wide track stirrups, which was amazing. She's going to check when she gets home from work and let me know so I can let you guys know. http://www.rmkequestrian.com/index.html This is a lady that was one of Mary's CWD clients. She does custom work if you would like something custom, too. Even does them in full-grain leather with tassels and crazy stuff like that. I really need to get some stirrup covers! It's wonderful. Even just so that arena sand doesn't rub against your saddle from the treads. Two lessons a week sounds amazing! that's awesome!!! the bend thing is really a struggle for me too ... i like this way of explaining how the outside thigh helps!